Treatment of tertiary alcohols with HCl leads to the formation of tertiary alkyl chlorides. The order of reactivity of alcohol is tertiary > secondary > primary > methyl which is opposite of reactivity in SN2 substitution. 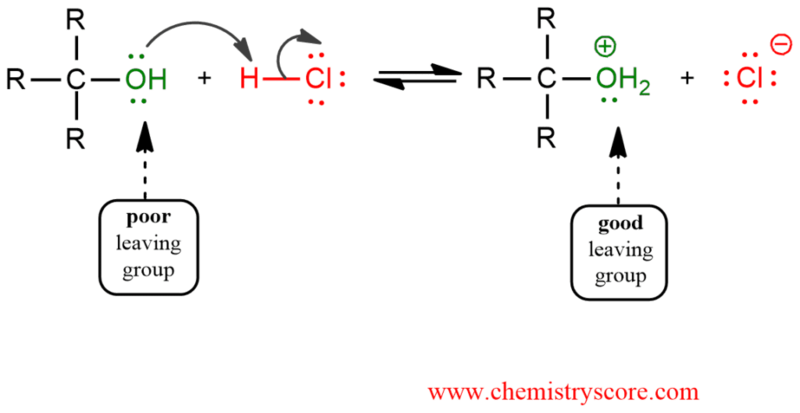 Methanol and primary alcohols will proceed via an SN2 mechanism since these have highly unfavorable carbocations. Secondary alcohols can also be subject to both an SN1 or SN2 depending on the reaction conditions. Reaction with tertiary alcohol usually proceeds via an SN1 mechanism where the carbocation is obtained as an intermediate which can undergo rearrangement. STEP 1. The alcohol is protonated to gives its conjugate acid which is a good leaving group. This is very fast and reversible step. STEP 2. Cleavage of the C-O bond allows the loss of the good leaving group, a neutral water molecule, to give a carbocation. Bond breaking is endothermic reaction so this step is the rate-determining step. STEP 3. Nucleophilic attack of bromide ion to the electrophilic carbocation and alkyl chloride formation.